Two-photon excitation microscopy is a fluorescence imaging technique that allows imaging of living tissue up to about one millimeter in depth. It differs from traditional fluorescence microscopy, in which the excitation wavelength is shorter than the emission wavelength, as the wavelengths of the two exciting photons are longer than the wavelength of the resulting emitted light. Two-photon excitation microscopy typically uses near-infrared excitation light which can also excite fluorescent dyes. However, for each excitation, two photons of infrared light are absorbed. Using infrared light minimizes scattering in the tissue. Due to the multiphoton absorption, the background signal is strongly suppressed. Both effects lead to an increased penetration depth for these microscopes. Two-photon excitation can be a superior alternative to confocal microscopy due to its deeper tissue penetration, efficient light detection, and reduced photobleaching. It is becoming a rapidly deployed tool for rapid, in-vivo, volumetric imaging. For three-photon excitation fluorescence microscopy, the necessarily longer wavelength ultrafast pump pulse increases the image penetration depth even more than two-photon excitation. Ultrafast sources in the so-called biological imaging windows of 1300 nm and 1680 nm are of particular advantage, where the combination of Mie scattering and water absorption create optimal windows of excitation wavelength for maximal image penetration. This is reported in the following article: [Horton2013]. As biological tissue is easily damaged with excessive micro-illumination average power, shorter pulse durations (<200 fs) at a set average power increases the output fluorescent signal light. 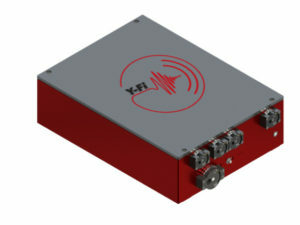 The KMLabs Y-FI OPA is an ideal tool for this important new application.